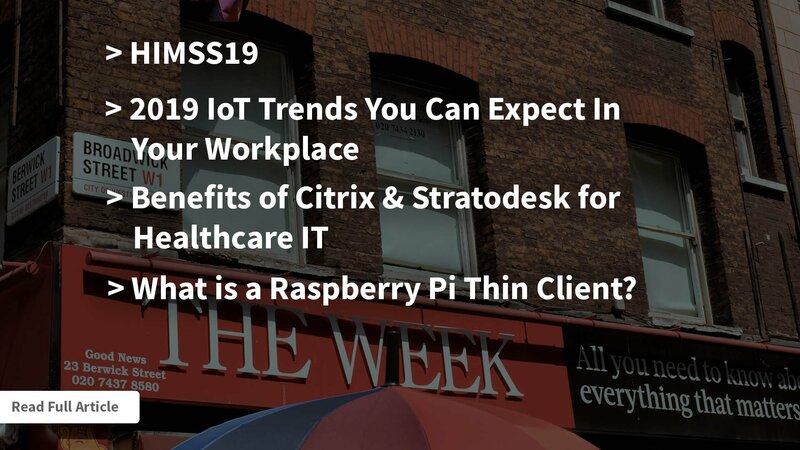 Stratodesk will be at HIMSS19 in the Citrix Partner Pavilion. Learn about our software firsthand in a live demo. Interested in getting a free coffee? RSVP for a meeting with us in advance. When you come to our booth, show us your verification email and we’ll give you your gift card! Emanuel Pirker, CEO of Stratodesk, says that in 2019, companies will seek a powerful solution to secure, run on and manage endpoint devices. Read his predictions to see why the IoT device will become a powerful alternative to x86 Thin Clients and PCs in the workplaces of the future. Study our most recent infographic before you get to HIMSS 2019. In this infographic, explore how Citrix and Stratodesk work together to enable these benefits for Healthcare endpoints. Healthcare organizations boost VDI security and accessibility with the NoTouch/Imprivata integration. NoTouch Desktop also streamlines endpoint management. Lastly, learn how we save healthcare money with PC Repurposing. Do you follow us yet on Twitter? Each week we share relevant industry trends, company news, and more! Below are a few highlights of what we’ve been up to lately. 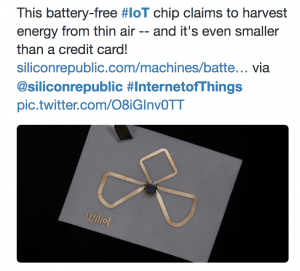 This battery-free IoT chip claims to harvest energy from thin air – and it’s even smaller than a credit card! This tweet had the highest impact since our last weekly update. Find out why by reading the story yourself. 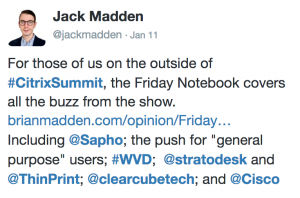 As mentioned in our previous blog post, Stratodesk made headline news at Citrix Synergy. This was thanks to the announcement of our ThinPrint Hub/workspace hub joint management solution. What is a Raspberry Pi Thin Client? In our last update, we shared our blog post on what is a Thin Client? Though once thought to be impossible, Stratodesk has proven that the Raspberry Pi is indeed a progressive yet highly efficient and productive solution for the enterprise. Our ready out of the box solution, the Citrix Ready workspace hub, is available from our partners NComputing and ViewSonic. But you can also create your own Raspberry Pi and power and manage it with Stratodesk software.